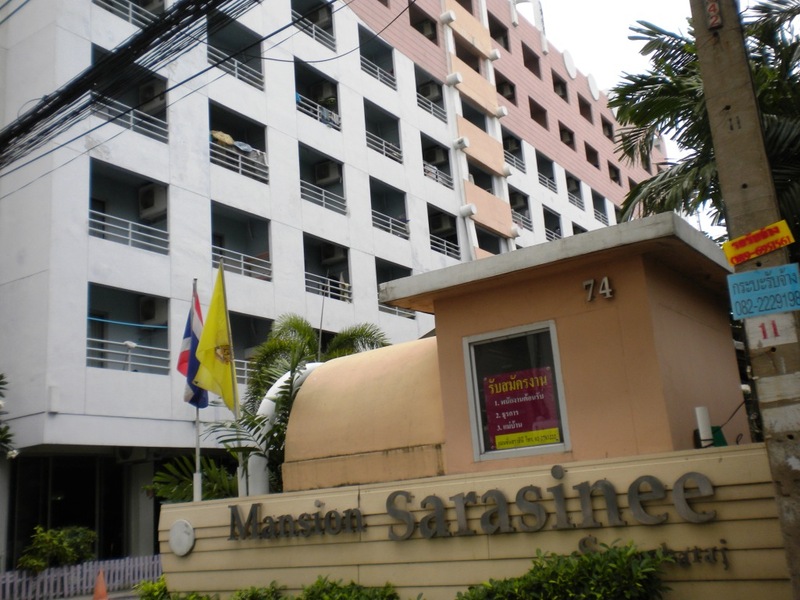 I had to check out of Bangkok Living and move to the accommodation I booked for my extra nights, Mansion Sarasinee @Chatuchak. (http://mansionsarasinee.com/) . It was an old non-luxurious building where-in its interior and exterior are like Singapore’s old HDBs. The building was not very difficult to find but it kind of disappointed me because I thought it’s close to BTS, but unfortunately, it was about 15-20min walk away from it. Anyway, consolation was staff there knows English and they’re very friendly. After checking in, I quickly took Saphan Khwai BTS to Ratchathewi and from there I went looking for the ‘pier’ going to the Golden Mount, Wat Saket, my first stop. I walked past through Hau Chang Bridge and to my surprise; it wasn’t the pier I was expecting to be. 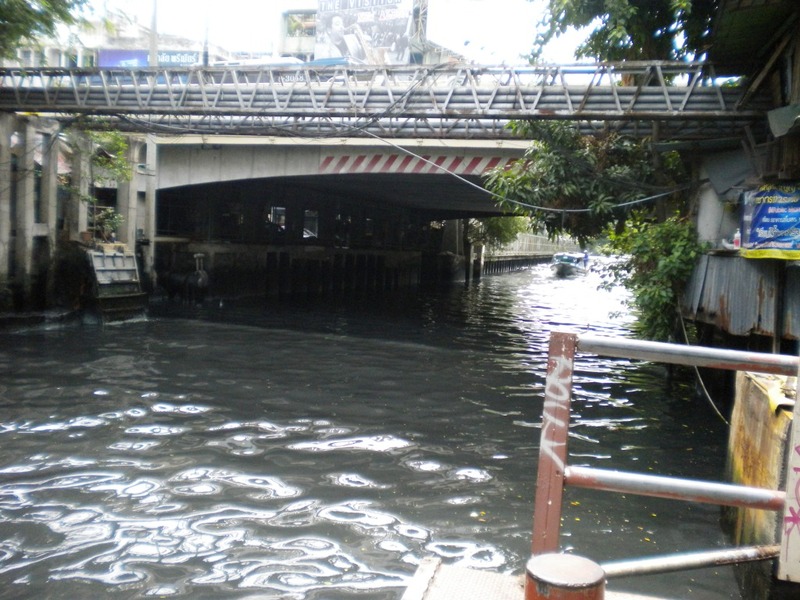 It was a small pier under the bridge (Hau Chang Bridge Pier). Hence, I followed the instruction of taking the boat from there to Pan Fa. 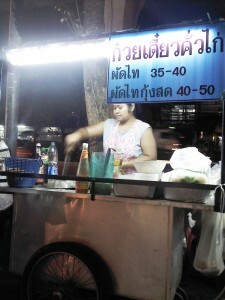 Fare was only 10Baht. Is the second grade royal temple. One of the important temple in Bangkok city. It was built in the period of Ayutthaya, originally named "Wat Sakae", King Rama l has ordered to renovate, dug a canal around the temple and named "Wat Saket". 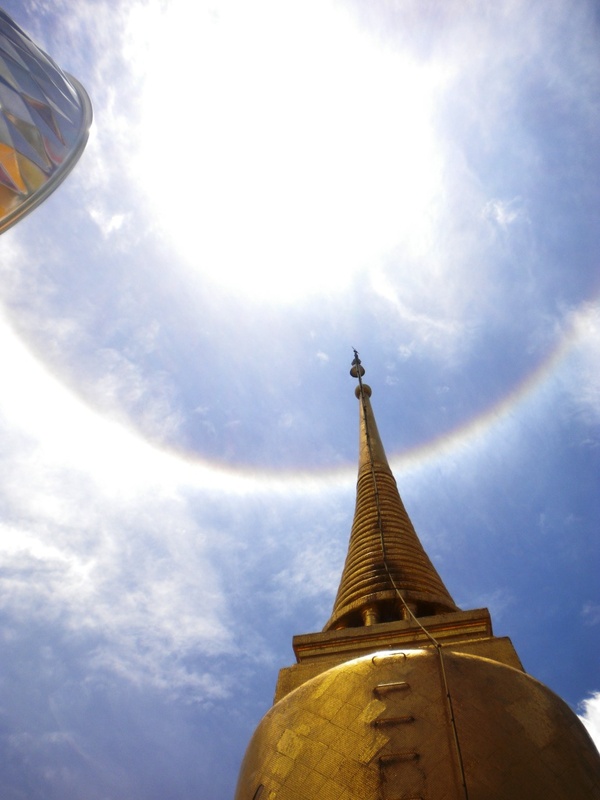 King Rama lll has renovated once and created the Golden Mount or Phu Khao Thong. "Ho Trai", that created in art of Ayutthaya period. Restored during the reign of the King Rama I, Wat Saket houses the Golden Mount, one of the most iconic and historical pagodas in Bangkok. 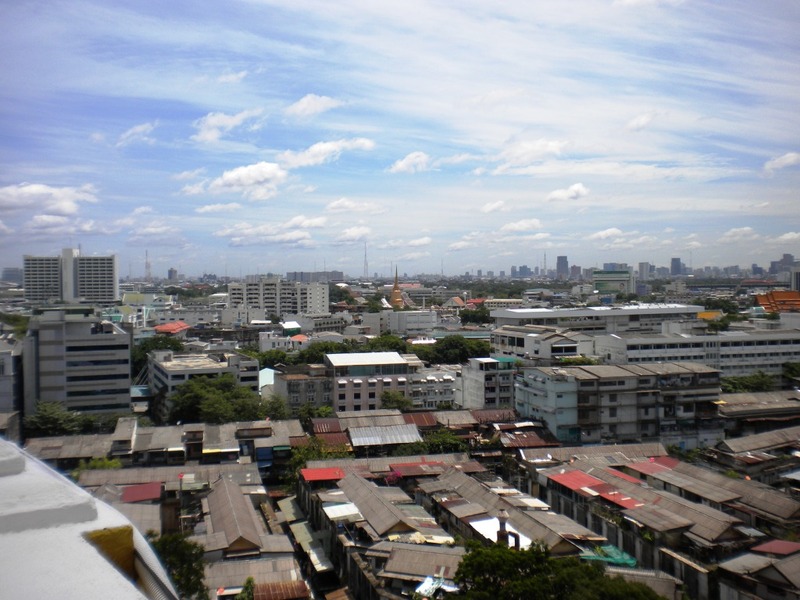 Visitors can enjoy the view of Bangkok from the top of the 78-metre tall pagoda. But many are here to pay homage to the enshrined holy relic of the Lord Buddha, which is believed to bring them fortune and security. Admission Fee : Free of charge for Thais and 20 baht for foreigners. 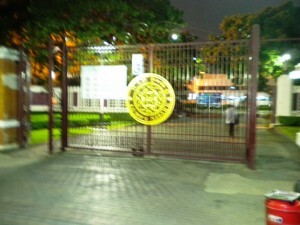 How to Get There : Take the Silom Line and get off at Saphan Taksin Station (or S6 Station) and go out through Exit No. 2. Then, take Chao Phraya Express Boat to Ta Tien Pier and take a taxi or tuk tuk to Mahachai Intersection crossing Rajadumnoen Klang Avenue. Or, take the Sukhumvit Line and get off at Ratchathewi Station (or N1 Station) and go out through Exit No.1. Then, walk towards Hau Chang Bridge to take a ferry from Hau Chang Bridge Pier to Pan Fa Bridge Pier and walk on to the temple. I then walked to the next temple. Wat Suthat. Is a first grade royal temple, one of six such temples in Thailand. Construction was begun by His Majesty King Rama I in 1807 and completed until the reign King Rama III in 1847. An official temple of King Rama Vlll of Ratanakosin period housing his majesty sculpture within the compound. Wihan house "Phra Si Sakayamuni" as the principal Sukhothai Buddha bronze image Subduing Mara posture. Around Wihan stand 28 selection of Chinese pagodas on the 6-tier basement representing 28 Lord Buddha. 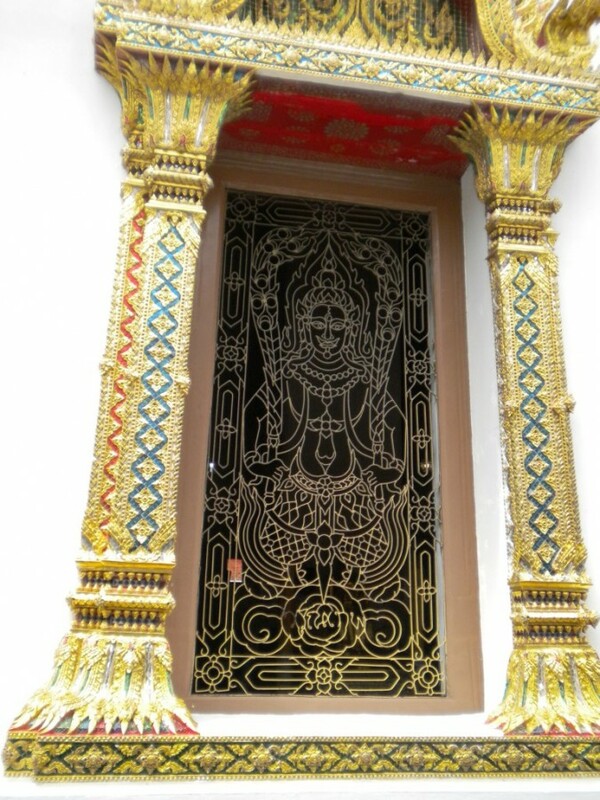 Ubosot, which is quoted for the longest of its kind in Thailand, houses Phra phutta Trilokkachet as the principal Buddha image in the Subduing Maha posture, larger than other Buddha image cast during Ratanakosin period. This temple is noted for its super murals in the main chapel as same as Santa Maria Delle Grazie which is acclaimed of its frescoed painting of Leonardo da Vinci's. Motto: "Enlarge your visions and fascinate surround people"
Wat Suthat is located before the Giant Swing on Bamrungmuang Road in the Phra Nakorn District. The temple features the tallest vihara, or chapel, with murals of the universe on its walls and houses a Buddha statue from the Sukhithai period named Phra Sri Sakkayamuni. People believe that making merit here will make them leaders of vision and full of charm. How to Get There : Take the Silom Line and get off at Saphan Taksin Station (or S6 Station), and go out through Exit No. 2. 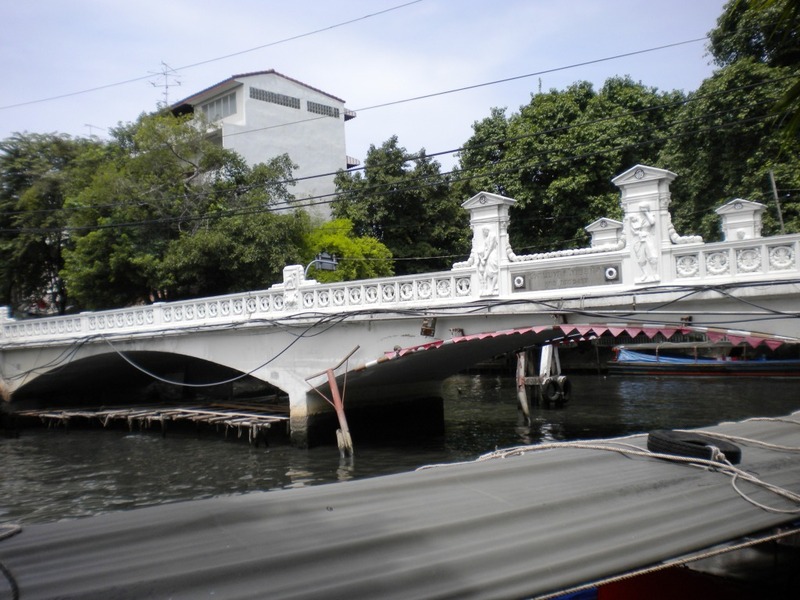 Then, take Chao Phraya Express Boat to Ta Chang Pier and take a taxi or Tuk Tuk to Wat Suthat, which is near the Giant Swing (Sao Ching Cha) on Bamroong Muang Road. I then decided to walk again to the third temple, Wat Bowornniwet. of King Rama lll, order to construct this temple during 1824-1832. It is the shrine-hall of Phra Phutthachinnasi, a very beautiful image which is mould in about 1357. 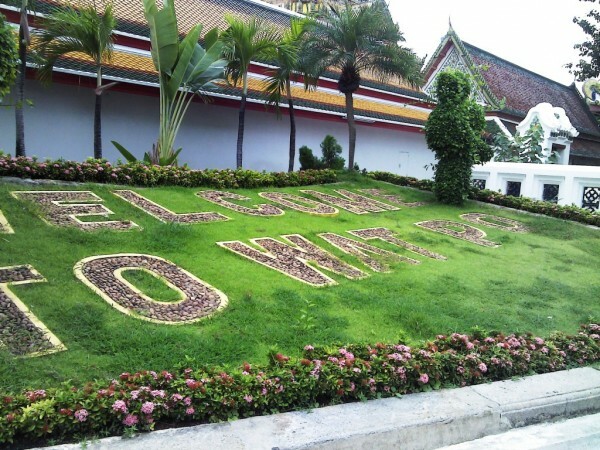 Originally named "Wat Mai" and received a name "Wat Bowornniwet Vihara" when King Rama lll invited his brother, King Rama lV who was then a monk, to be abbot of the temple. Wat Boworn is also the residence of members of royal family who enter monk hood i.e. King Rama Vl, Vll, lX. The important sites in Wat Boworn are "Ubosot", a "Trimuk" (three facade), decorated with glazed ceramics, where the seal of the Royal Crown located at the centre, another are the principal Buddha image, the Vihara the Chedi and the Panya residence, a place where the kings and the princes have stayed during their ordain. Motto: "Receive the good thing in life"
I then walked again to my fourth stop, Wat Chana Songkhram Ratchaworamahawihan . Lol at this point, I started to feel a little bit exhausted and the heat was starting to be unbearable, hence, I started planning to take tuk tuk or cab after this next temple. King Rama V, Queen Si Patcharintara respectfully invited the ashes of princes to house in the chape. Ubosot house the principal Buddha image of "Phra Puttanorasitrilokachet Mahetthisak Puchaneeya Chayantakodom Baromassada Anaworayan" in the Subduing Maha posture, made of plaster, lined with lead and gilded. 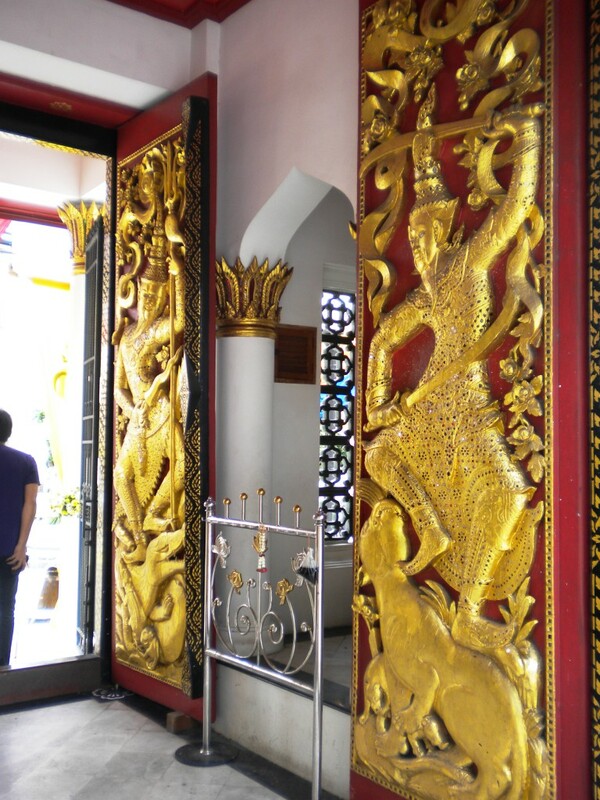 Motto: "Conquer All Obstacles "
The King Rama I commissioned the restoration of Wat Chanasongkram in honour of the troops of General Somdej Chao Phraya Maha Surasinghanat after consecutive victories in three battles. The presiding Buddha statue is called Phra Buddha Narasi Tri Logachet to which worshippers must pay homage on their visit. Around the chapel and behind the principle Buddha image are the urns containing the ashes of the princes of five kings. How to Get There : Take the Silom Line and get off at Saphan Taksin Station (or S6 Station) and go out through Exit No. 2. Take Chao Phraya Express Boat to Ta Chang Pier or Ta Phra Athit Pier and then, take a taxi or tuk tuk to Wat Chanasongkram, which is opposite Khao San Road. 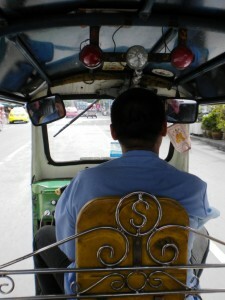 As per the plan, I took tuktuk to go to my next stop, Wat Phra Kaeo. Is the monastery within the royal palace compound. King Rama l order to build this temple in 1783 for his convenience in philanthropy practices. 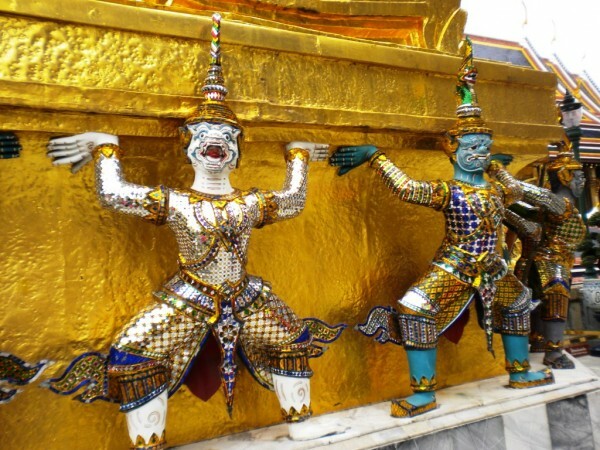 Situated at the northeastern corner of the Grand Palace compound. The Ubosot housing "Phra Phuttamahamani Rattanapatimakhon" (The Emerald Buddha) where the image of the Emerald Buddha is enshrined as royal religious ceremonies have been performed. And the beautiful and the longest mural painting illustrated to Ramayana Epic. Prasat Phrathepbidorn is the stupa installing pictures of King Rama l to Vlll. Phra Siratana Chedi pagoda, cover with golden ceramic, house relics of Lord Buddha. 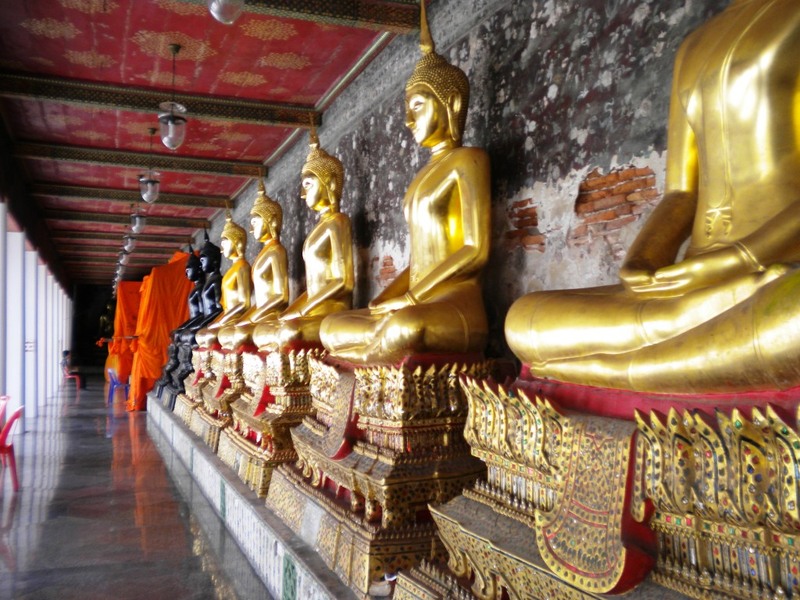 Buddha images of each King of Ratanakosin period are in Phra Ratchapongsanushon Tower. 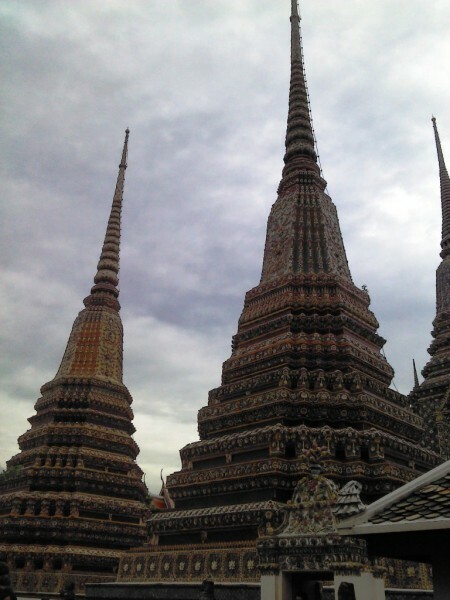 Monuments of Kings of Ratanakosin are also in this temple. Beside, there are 6 pairs of giants from Ramayana Epic, made of plaster and cover with colorful ceramics, standing at each balcony gate. 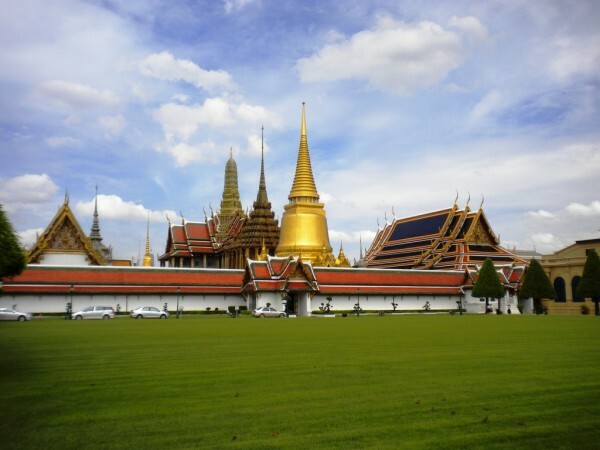 Motto: "Endless Wealth and Prosperity"
The King Rama I established the temple in the Grand Palace. The temple is renowned for having the world’s finest and longest compound walls, decorated with typical Thai murals, based on the Indian epic Ramayana. The statue of the Emerald Buddha, the most sacred of all statues, officially titled Phra Buddha Maha Maneerattana Patimakorn, is enshrined here. How to Get There : Take the Silom Line and get off at Saphan Taksin Station (or S6 Station), and go out through Exit No. 2. Then, take Chao Phraya Express Boat to Ta Chang Pier and walk to the temple. I then walked again to my 6th stop, the famous Reclining Buddha, Wat Po. King Buddha Loetla Naphalai (King Rama ll). The temple is also a "University of the people" in which knowledge of various subjects has been collected and inscribed on stone in the area of the Ubosot, so that the people can receive knowledge. 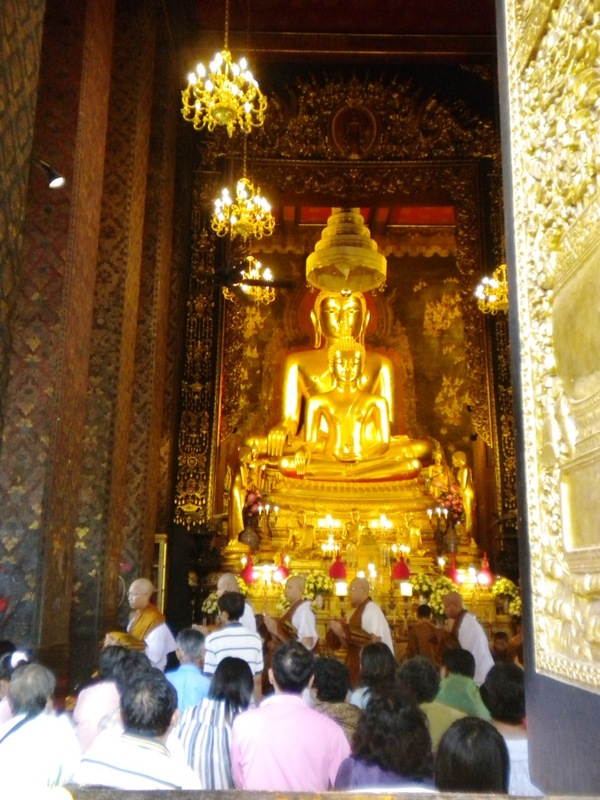 In Wat Pho, Phra Buddha Deva Patimakorn is enshrined in the Ubosot. Under the pedestal are the ashes of King Rama l.
There is also the vihara enshrining the attractive Reclining Buddha, Phra Buddhasaiyas that is the 4th largest in Thailand. Total of 45m long and 15m high. It is made of bricks and plaster, gilded in gold leaf and lacquer. The soles of the feet are intricately inlaid with mother-of-pearl depicting the 108 lakshanas, the auspicious signs of the Buddha. 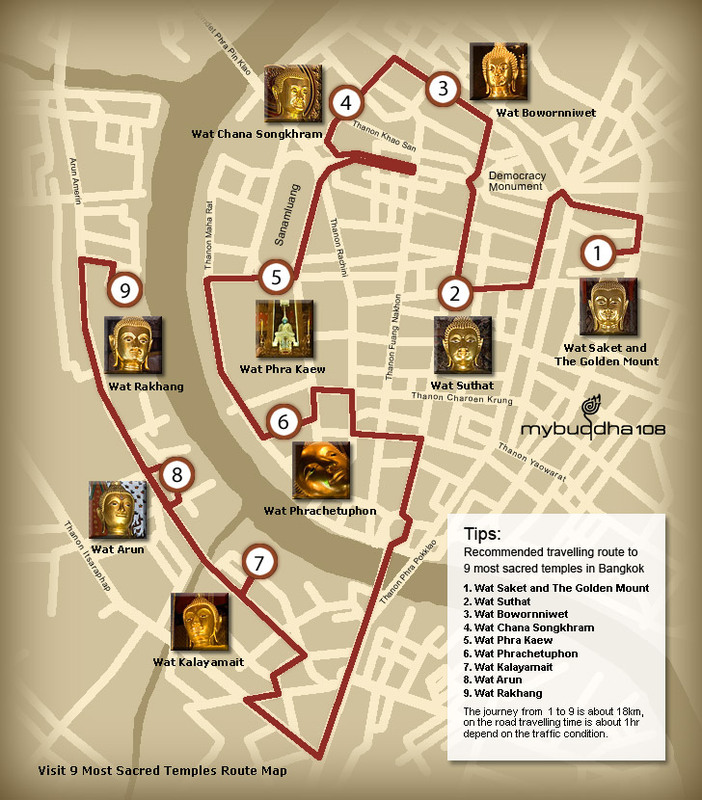 In addition, Wat Pho has 99 chedis, known as the temple with the most chedis in Thailand. 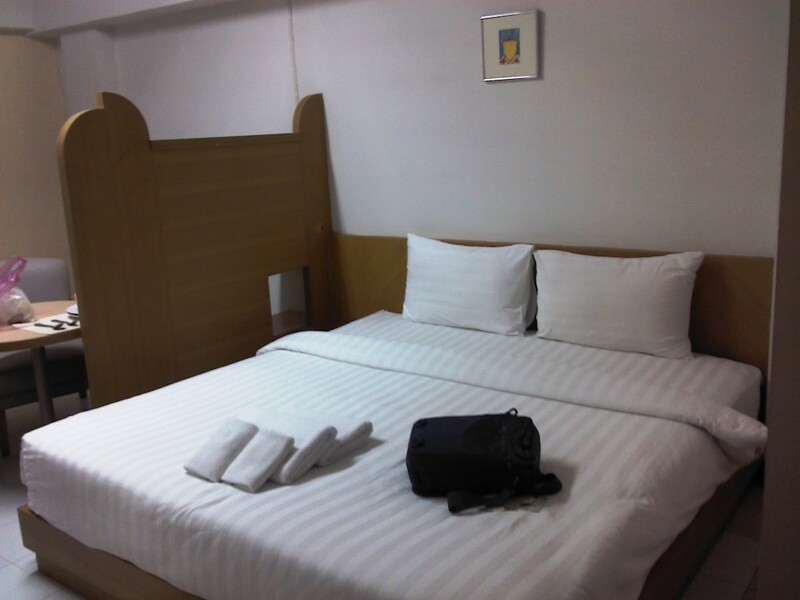 For a good choice of hotels with discount prices, visit Place to stay in Bangkok for more information. The temple boasts a variety of attractions highlighted by its 99 pagodas and Phra Maha Chedi Si RajaKarn, a group of four huge pagodas built in honour of the four kings of the Chakri dynasty who were alive in the same period. 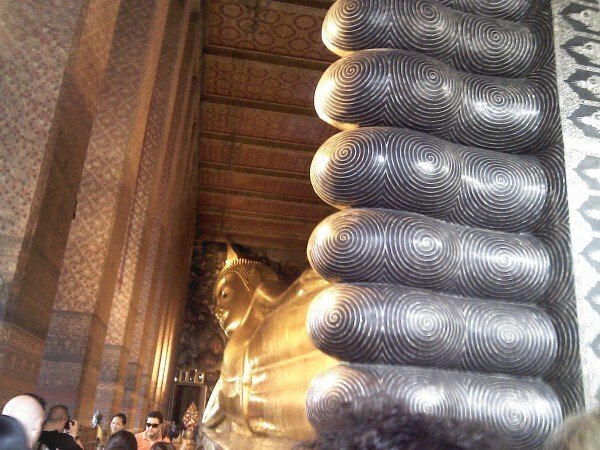 Sculptures of self-exercise hermits in different postures, and the legendary 46-metre long reclining Buddha. The unofficial name Po, refers to the Bodhi tree, which is a large long-living type of tree with long leafy branches that provides a lot of shade. 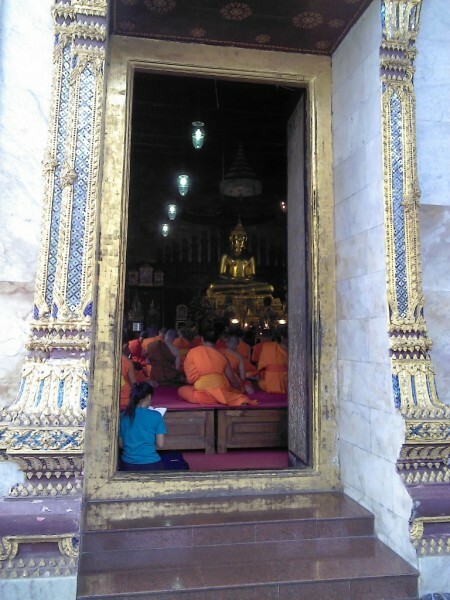 People believe that making merit here will bring them peace and happiness, translating into Thai as a cool and pleasant feeling like being in the shade. According to them, within the complex, there’s a School that teaches Thai Massage, that’s why to get the best of it, better have a massage, inside the complex. I saw the signage for it, but unfortunately, I didn’t have enough time to go and experience authentic Thai massage. I then decided to go to the supposedly last temple because it’s closing time’s at 5pm. I took metered taxi just to reach there before it closes , Next temple, Wat Rakhang Khositaram Woramahawihan. 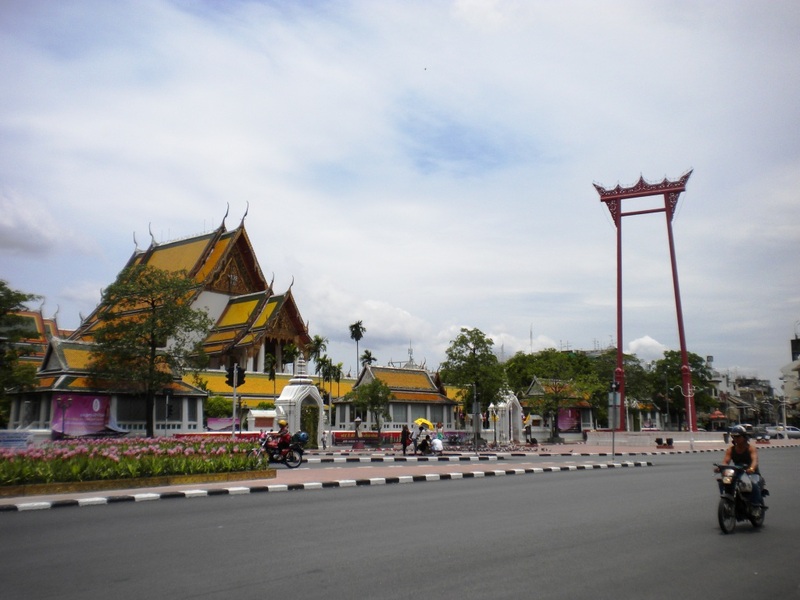 It located at Bangkok Noi Thonburi district, It was built during Ayutthaya period, originally called "Wat Bangwayai". "Rakhang" mean temple bell. During the reign of King Rama I, when a bell was found in the temple compound. Later, King Rama II had this moved to Wat Phra Kaew, and replace five new temple bells at the compound. 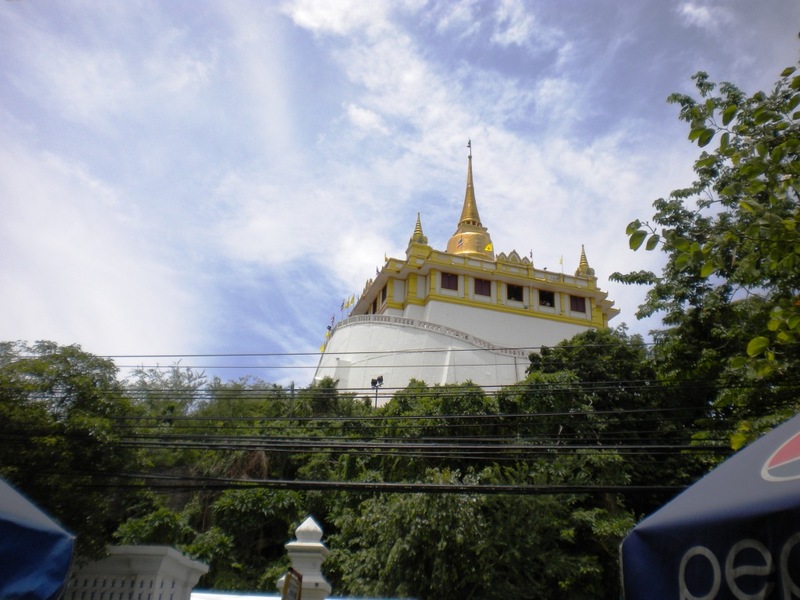 It is the residence of Somdej Phra Phuthtajarn Toh Promarangsi or Somdej Toh, Chairman of the Ecclesiastical Council who has been well-known of this practices. Ubosot house the principal Buddha image name "Smiling Principal Buddha" by King Rama V.
To pay homage to Somdej Phra Phutthajarn Toh Promarangsi is to pray religious verse called "Jinabunchon", place incense sticks into the incense burner, gild the buddha image, sprinkle with holy water for good luck before paying respect to the principal Buddha image in Ubosot. Motto: "To be admired and loved "
The temple was built in the Ayuddhaya period. 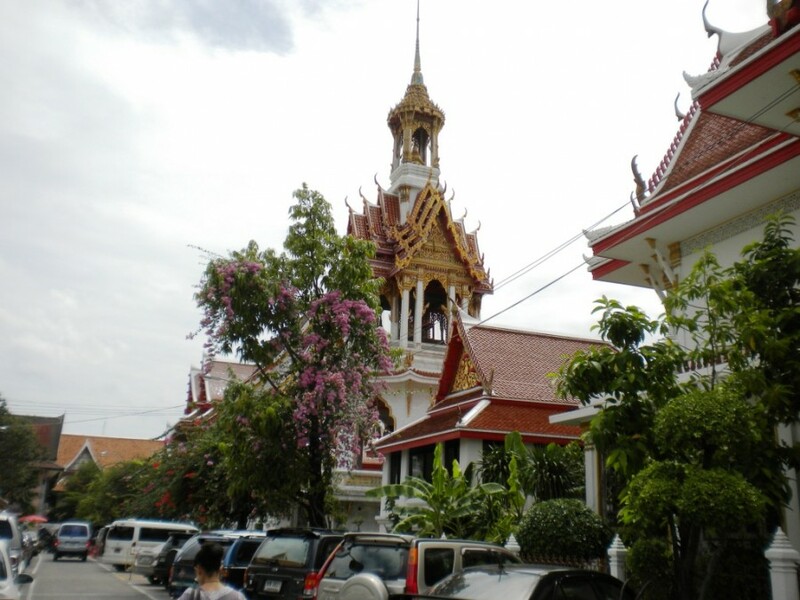 When King Rama I ordered a major restoration to the temple, a bell with very beautiful chime was found. 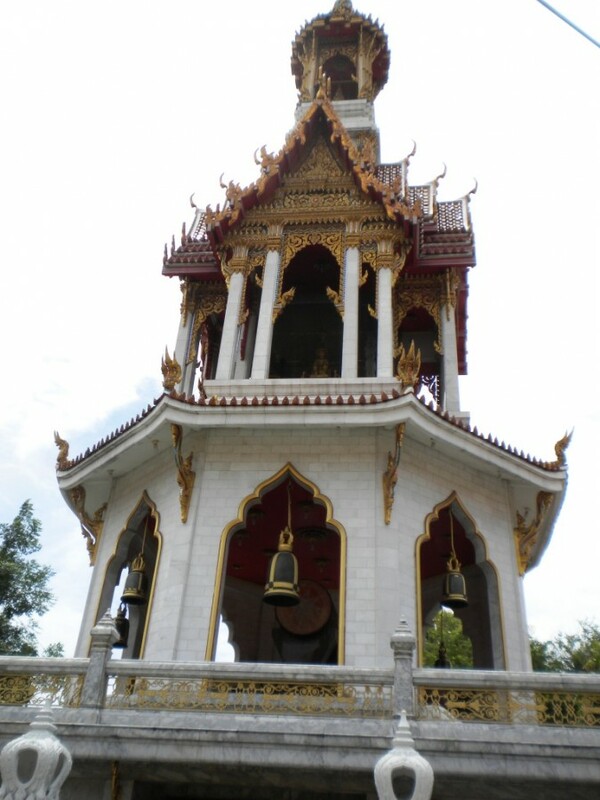 The bell had been transferred to the Emerald Buddha Temple and five newly built bells were fitted here. 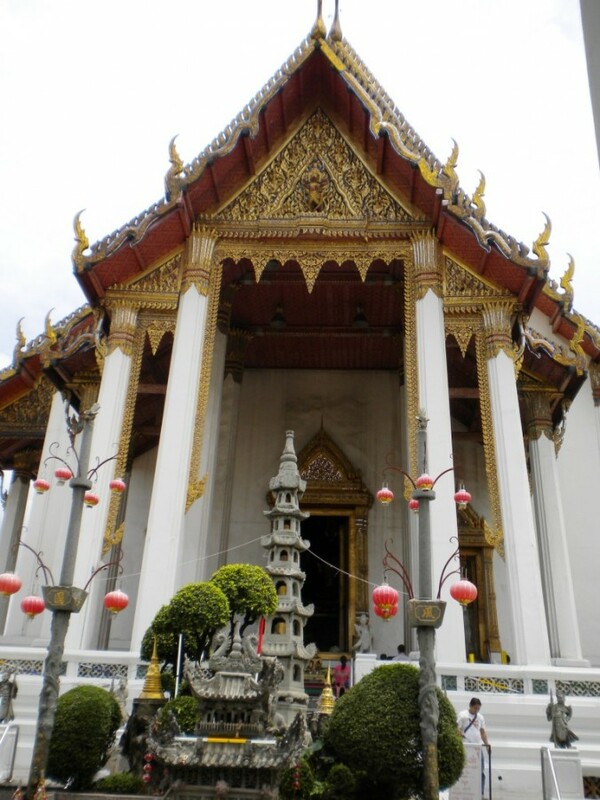 The temple was then renamed Wat Rakhang, translating as ‘bell’ in English. Opening Hours : Daily from 08.00 hrs – 17.00 hrs . How to Get There : Take the Silom Line and get off at Saphan Taksin Station (or S6 Station), and go out through Exit No. 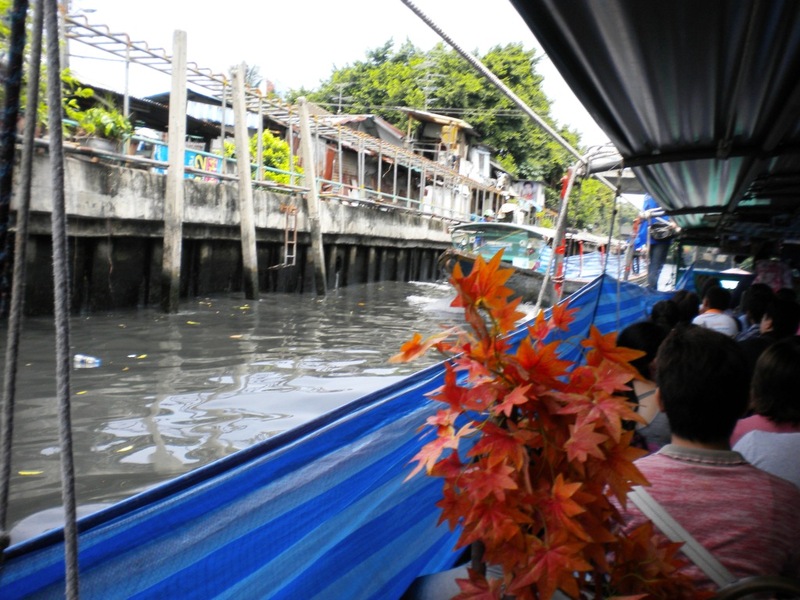 2 Then, take Chao Phraya Express Boat to Ta Chang Pier, followed by a ferry boat to Wat Rakang Pier. 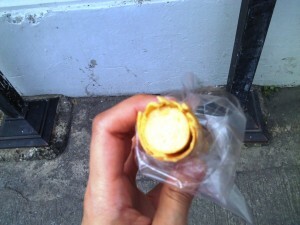 Coming of Wat Rahkang, I saw this interesting streetfood, something like waffle with hotdog inside, so I gave it a try. 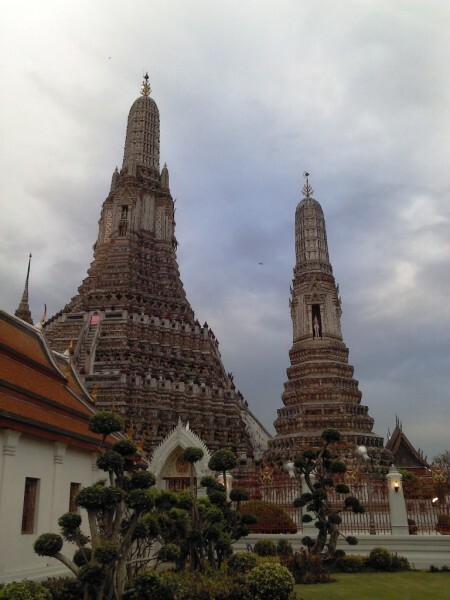 Afraid that, I know that the next two temples would be closing soon, I decided to take cab to Wat Arun, The Temple of Dawn. Unfortunately, my gut feeling was correct; it was already closed when I arrived. I was able to take photos of its exteriors though. Or Wat Arunratchawararam Ratchaworamahawihan is the royal principal monastery built in Ayutthaya period. King Taksin the Great gained victory in the battle and moved his troop from Ayutthaya to see the new day at Wat Mokok. 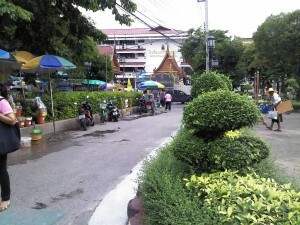 Since then, this auspice made this temple called " Wat Jaeng" King Rama lV graciously renamed as "Wat Arunratchawararam". 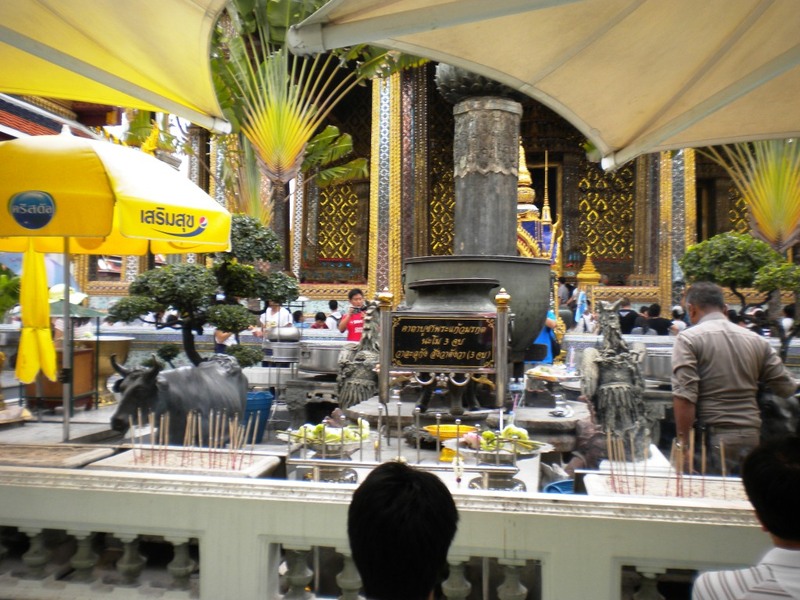 It was the house of the Emerald Buddha before the Buddha image was invited to house at Wat Phra Kaeo. 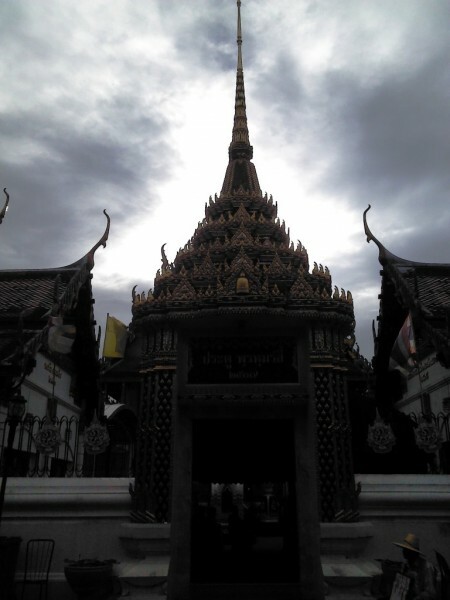 Phra Arun (or Phra Jaeng), that King Rama lV graciously invited from Vientiane. 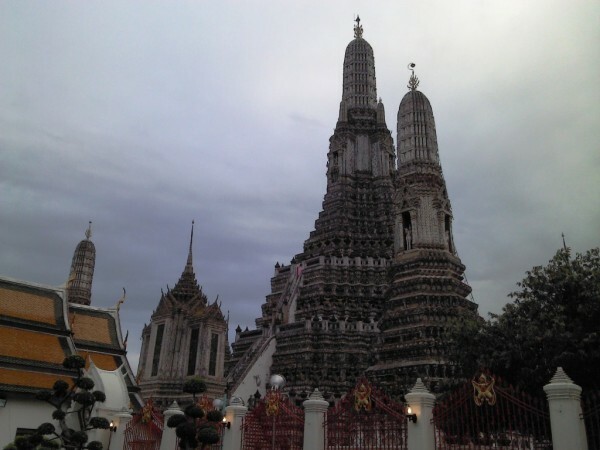 Motto: "Have A Prosperous Life"
Wat Arun or Wat Chaeng houses world’s tallest prang, a Khmer-style tower, rising to 70 metres in height. The presiding Buddha statue, Phra Buddha Dharma Misrara Chalogadhadilok, is said to have been moulded by the King Rama II himself. People believe making merit here will bring glory to their life. How to Get There : Take the Silom Line and get off at Saphan Taksin Station (or S6 Station), and go out through Exit No. 2 Then, take Chao Phraya Express Boat to Ta Tien Pier, followed by a ferry boat to Wat Arun Pier. I didn’t anymore proceed to complete the 9th because I know it’ll be a waste doing so. I was pretty certain that it’s already closed. I just went on a cab ride to Lumpini park. 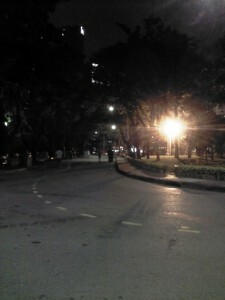 Due to very tight traffic jam, I reached the park late. It was dark and I really couldn’t see its beauty. 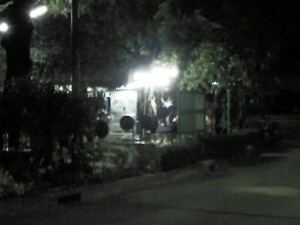 I saw some macho guys jogging and working out at this very interesting outdoor gym though. I thought I’d be lucky to see some Muay Thai matches because sometimes, they do have it there, but nah..I guess it’s already too late. 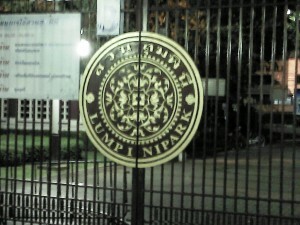 Lumpini Park, the first park in Bangkok, was created by King Rama VI on royal property. This park offers a multi-purpose open public space, housing various recreational centres, health-related associations and clubs. Opening Hours : Daily from 04.30 hrs. – 21.00 hrs. How to Get There : SkyTrain to Sala Daeng Station (S2) and leave via Exit No.6, then walk across Rama IV Road to the memorial statue of King Rama VI. After a few minutes of walking, I decided to head home. The cab brought me to the nearest BTS station and I headed home. 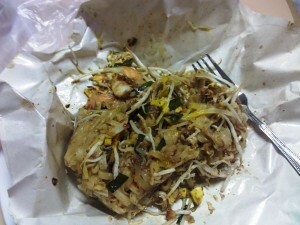 I bought Pad Thai from the street vendor and surprisingly, it was good. This entry was posted in Uncategorized and tagged adventures, alone but not lonely, on my own, temples, travel. Bookmark the permalink.